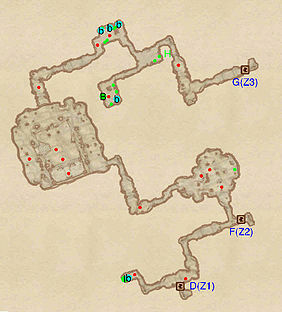 Lake Arrius Caverns is a large cave north of Cheydinhal containing NPCs (quest-related). It contains four zones: Lake Arrius Caverns, Shrine Antechamber, Dagon Shrine, and Shrine Living Quarters. 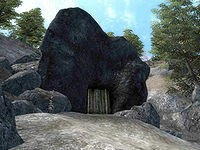 If the quest has not yet begun, you can enter the cave and proceed as far as the door to the shrine, where you can kill the Doorkeeper and steal his Mythic Dawn robes, but the door itself is locked and the Doorkeeper does not have the key. Even after Light the Dragonfires is completed, you can still find Mythic Dawn enemies in this cave. 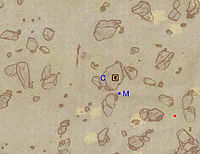 This location's map marker (M on map) is named Lake Arrius Caverns (editor name LakeArriusMapMarker). The entrance door is NNW of the marker, 30 feet away. 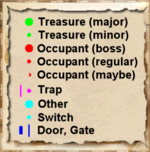 This is a very straightforward cave layout. Once you step in you will be greeted by a Dunmer named Harrow and he will demand you to hand over your possessions. Once you do this you will follow him to the Shrine Antichamber. This is where Harrow leads you to the next area. 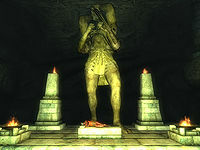 After you listen to the speech and choose whether or not to sacrifice the Argonian, you must grab the Mysterium Xarxes and kill everyone you see with some low quality loot.